Nowadays, determination of the iron ions with high sensitivity and selectivity with novel methods becomes a matter of urgency for monitoring healthy body and environment. In this paper, for the first time, we present a set of high-performance TiO2 nanotube arrays which are quite sensitive to iron ions. Firstly, the anodic oxidation method was adopted to prepare ordered TiO2 nanotube arrays, followed by functionalized Ag nanoparticle deposition with the enhancement ability in iron ion sensing. Besides, the spectrum of the TiO2 nanotube with/without the Ag nanoparticles was analyzed with an X-ray photoelectron spectrometer, which shows that Ag nanoparticles can effectively reduce the recombination rate of electrons and holes, and increase the conductivity and the charge transfer rate of the electrodes. Further, when functionalized Ag nanoparticles on well-ordered TiO2 nanotube arrays were used, iron ion sensing performed with the anodic stripping voltammetry method was investigated to validate the great potential of TiO2 nanotube arrays with a sensitivity of approximately 30 μA/ug/L in becoming Fe3+ sensors. This method creates new possibilities for developing sensors for monitoring of Fe3+ in biological samples without any sample pretreatment procedure. Iron is an important nutrient element for human health, which is usually responsible for transfer and transport of oxygen and block materials, and ranks second among the most essential metal elements in the human body. However, an excessive amount of iron ions in a living cell can catalyze production of reactive oxygen species (ROS) via the Fenton reaction, which can lead to diseases, such as kidney disease, and disturb the cellular homeostasis resulting in Alzheimer’s, Wilson’s, and Menkes diseases [1, 2]. As a matter of fact, due to its wide application in industry and agriculture, the potential toxic effects of iron from contaminated rivers, lakes, or oceans on humans remain a global challenge [3, 4]. Consequently, it is particularly necessary to monitor healthy body and environment to develop practical and efficient technologies used for rapidly determining the iron ions with high sensitivity and selectivity. Nowadays, there are many methods for detecting metal ions, such as atomic absorption spectrometry, inductively coupled plasma mass spectrometry, and inductively coupled plasma emission spectrometry. However, complicated equipment and sample preparation steps are needed in these methods, which will also result in a large cost. Recently, an enormous effort has been made to studies on nanoparticles, such as graphene [5–12], graphene quantum dots [13–18], carbon dots [19–21], and noble metal nanoparticles or nanoclusters in the desired dimension for sensing of metal ions, which have attracted much attention because of good selectivity, high sensitivity, and easy operation. Vinod Kumar Gupta et al. have developed a method for synthesizing imine through a simple condensation reaction and exploring their metal detection abilities through electrochemical and optical methods. Fe3+ detected by colorimetric (L2) at a low concentration can reach 1.29 × 10−6 M. But this method is limited due to factors such as high detection limits, and strong interference . Xiaohui Gao et al. reported a facile colorimetric sensor based on the N-acetyl-L-cysteine (NALC)-stabilized Ag nanoparticles (NALC–Ag NPs) for detection of Fe3+ ions in aqueous solution. This method can be used to perform sensitive and selective detection of Fe3+ ions in water with a linear range from 80 nM to 80 mM and a detection limit of 80 nM . Kailasa S K et al. have developed a selective and sensitive colorimetric method for determination of Fe3+ ion by using p-amino salicylic acid dithiocarbamate functionalized gold nanoparticles (DTC-PAS-Au NPs) as colorimetric probes [24, 25]. On the basis of such detection, inductively coupled plasma (ICP) analysis coupled with mass spectrometry (MS) or optical emission spectroscopy (OES) was preferably adopted for iron ion analysis . On the other hand, TiO2 nanotubes, with high chemical stability, are widely applied in various industries due to their excellent photo-electrochemical, catalytic, and adsorption properties as well as nontoxicity, such as gas/moisture sensors , photocatalytic decomposition of water into hydrogen , photocatalytic degradation of organic pollutants , dye-sensitized solar cells , biosensors , and supercapacitors . Particularly, well-structured and highly ordered TiO2 nanotubes are well suitable for directional and rapid transfer of electrical charges [33–36]. Further, surface functionalization of Ag NPs plays a crucial role in increasing analytical applicability for TiO2 nanotubes detection of trace analytes with high selectivity and sensitivity. Hence, considering combination of TiO2 nanotubes and metal ion detection at trace level is highly desirable. As far as we know, there are very few reports on usage of functionalized TiO2 nanotubes as based probe for Fe3+ detection. 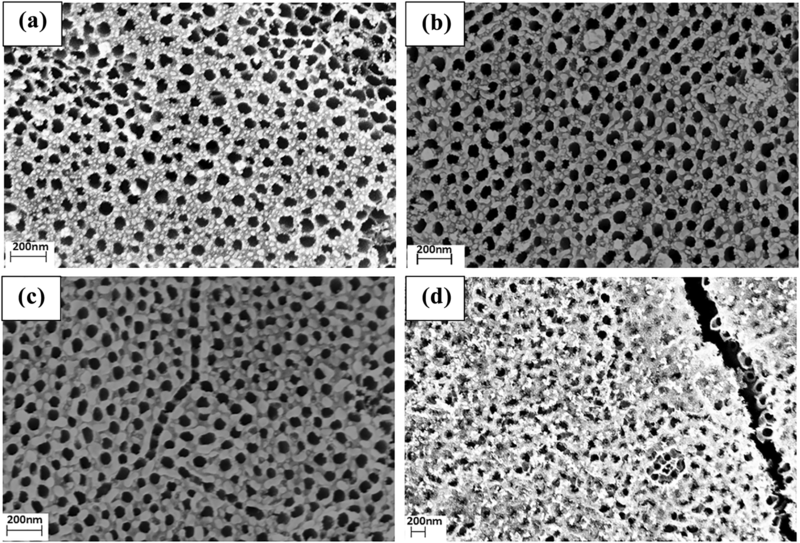 In this paper, a set of high-performance TiO2 nanotube arrays which are quite sensitive to iron ions are presented. Firstly, the anodic oxidation method was adopted to prepare ordered TiO2 nanotube arrays, followed by functionalized Ag NPs with the ability of iron ions sensing. Besides, the spectrum of the TiO2 nanotube with/without the Ag NPs was analyzed with an X-ray photoelectron spectrometer. Further, iron ion sensing with the use of functionalized Ag NPs on well-ordered TiO2 nanotube arrays through the anodic stripping voltammetry method was investigated to validate the great potential of heavy metal sensors of TiO2 nanotube arrays. This method creates new possibilities for developing sensors for monitoring Fe3+ in biological samples without any sample pretreatment procedure. Where, σ = exp[(nF/RT)(∆E/2)], and N is the number of electrons participating in reactions with metals. F, A, D, C, and tm represent Faraday constant, area of the electrode, diffusion coefficient, and the concentration of the metal ions, and pulse width respectively. It can be seen from this equation that the current is proportional to metal concentration. A pure titanium sheet (20 × 20 × 0.1 mm; purity 99.9%) was chemically polished to remove the oxide layer and create a smooth surface. To be specific, a proper amount of HF acid with a concentration of 40% was poured into ionized water proportionally (0.5%); then, the titanium sheet was dipped into the pre-prepared solution for 10 s and was taken out instantly and then dried with nitrogen. Next, it was ultrasonically washed in acetone, absolute ethyl alcohol, and deionized water at 30 °C for 12 min respectively. In the process, acetone was mainly used to clean the surface of the Ti sheet with a roughness of 0.139 μm and 0.066 μm before and after the treatment, respectively. Pretreatment of the Ti sheets is necessary prior to experiments for higher smoothness. The experimental setup was applied in Ref. . The AMICUS X-ray photoelectron spectrometer (XPS) from Shimadzu was used for quantitative composition definition of the prepared TiO2 nanotube arrays. Ag nanoparticles (NPs) with various sizes were deposited onto the TiO2 nanotubes surface (QPrep400, Mantis) with the power of 60 W under vacuum conditions of 10−3 Torr. Purity of the Ag plate was 99.9999%. An electrochemical workstation (CHI660E, Shanghai Chenhua) was used to perform the stripping voltammetry experiments for detecting the concentration of Fe3+ ions. A three-electrode system (working, reference electrode, and auxiliary electrodes) which is consisted of two loops was used to monitor the electrochemical reaction process of the working electrode and to keep the equilibrium of the chemical reaction. In the experiments, four types of Fe3+ with the concentrations of 10 μg/L, 20 μg /L, 30 μg/L, 40 μg/L, and 50 μg/L were mixed in ammonium chloride, respectively. When detected, neutral iron firstly was adsorbed onto the TiO2 nanotubes surface with/without Ag deposition after reduction reaction with Ti substrate, followed by re-oxidized when reverse bias was applied. The scanned voltage ranged from − 1 V to 1 V with a step of 0.005 V. The minimum detectable current was 10−5A, and the detected duration was 120 s. Concentration of Fe3+ ions was evaluated from the dissolution current peak’s dependence on voltage. TiO2 nanotube arrays produced in electrolyte composed of glycol, 2 vol% water and 0.3 wt% ammonium fluoride with the oxidation voltage being 60 V, the oxidation time being 2 h, the oxidation temperature being 40 °C, and the calcination temperature being 500 °C had the optimal morphology and performance . Topography and side-view scanning electron microscope (SEM) images of the TiO2 nanotube arrays are shown in Fig. 2a, b, respectively. In Fig. 2a, the TiO2 nanotube arrays are well-arranged with an average diameter of 50 nm. In Fig. 2b, length of the nanotube is approximately 19.2 μm with a relative tilted angle of 30° with substrate when measured. From these results, it can be seen that the contact area with Fe3+ ions for the nanotube arrays can be obviously increased as length of the tube increases, which can improve detection sensitivity effectively. Figure 3a–d shows SEM images of TiO2 nanotubes with Ag nanoparticle deposition with durations of 30 s, 35 s, 40 s, and 45 s respectively. In Fig. 3a, when deposition duration was 30 s, the average diameter and coverage thickness of the Ag nanoparticles adsorbed on the wall of the nanotubes were approximately at 10 nm and 5 nm respectively. From these results, it can be seen that the nanoparticles are uniform in size distribution. In Fig. 3b, c, when deposition durations were extended to 35 s and 40 s, state of Ag nanoparticles became cluster state gradually and diameters of the Ag particles increased to 20 nm and 25 nm respectively. Diameters of the Ag nanoparticles further increased until they became clusters that partially cover the surface of the TiO2 nanotube when the deposition time increased to 45 s, which is shown in Fig. 3d. In order to confirm composition of the TiO2 nanotube arrays with/without Ag particle adsorption with a duration of 30 s, XPS experiments were performed, which are shown in Fig. 4a–d. In Fig. 4a, the spectra of Ag were given with the intensities of 3200 and 2400 counts when the values of binding energy were 368.24 eV and 374.25 eV, respectively, which showed that FWHM (full wave at half maximum) of Ag was approximately 1 eV. From this results, it can be seen that only one chemical state Ag0 was detected after Ag deposition. In Fig. 4b, spectra of Ti with/without Ag deposition were given and marked with red and black lines. Before Ag deposition, the observed values of binding energy of Ti were 459.60 eV and 465.18 eV with the intensities being 2250 and 1250 counts, respectively. In contrast, the values of binding energy of Ti were 458.88 eV and 464.66 eV with the increasing intensities being 3250 and 2700 counts respectively after deposition. The difference in binding energy before Ag deposition was 5.58 eV; in contrast, the difference after deposition changed to 5.78 eV, which was increased by 0.3 eV approximately. Besides, the two titanium peak shifts were 0.72 eV and 0.52 eV respectively. This phenomenon was caused by the interaction of Ag NPs. Similar phenomena were observed on the spectra for oxygen and carbon with/without Ag deposition, which are shown in Fig. 4c, d respectively. Before deposition, the values of binding energy of oxygen were 530.89 eV and 533.28 eV with the intensities being 3500 and 4500 counts, respectively. These results showed that the oxygen was in a negative two-valence state (lattice oxygen) and consisted of TiO2 with titanium. On the other hand, the value of binding energy of oxygen was 530.24 eV with the intensity being 4900 counts after deposition. Besides, the value of oxygen peak of binding energy, 533.28 eV, disappeared after deposition, and the oxygen peak shift was 0.67 eV. 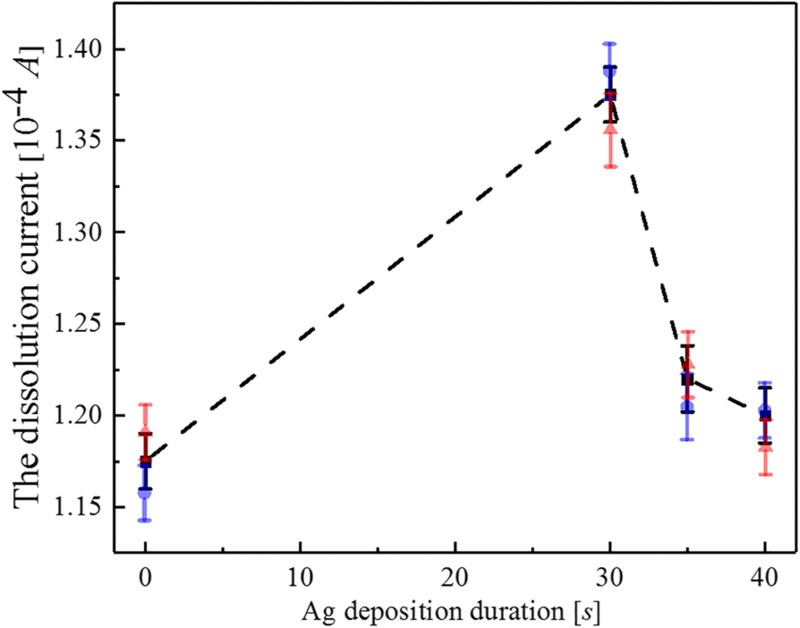 These results demonstrated that the state of oxygen was changed from lattice oxygen to adsorbed oxygen due to the reaction with Ag NPs after deposition. In Fig. 4d, we detected the spectrum of carbon contamination on TiO2 nanotube arrays with/without Ag deposition, which were marked with red and black lines respectively. The value of binding energy of carbon contamination was 285.41 eV with the photon number intensity being approximately 1350 counts before deposition. On the contrary, the value of binding energy of carbon contamination was 284.80 eV with the photon number intensity being approximately 1050 counts after Ag deposition, which meant that the value of binding energy and the photon number of carbon was reduced by 0.59 eV and 30% respectively. These results indicated that the amount of carbon contamination was significantly reduced after Ag NPs deposition. In other words, deposition of Ag NPs can reduce contamination of the electrode as well as improve the efficiency of charge transfer. It should be noted that shift of binding energy measured after deposition was approximately 0.8 eV, which was mainly due to shift of carbon. Therefore, TiO2 nanotube arrays deposited with Ag NPs can effectively reduce the recombination rate of electrons and holes, and increase conductivity and charge transfer rate of the electrodes compared to TiO2 nanotube arrays without Ag NPs. 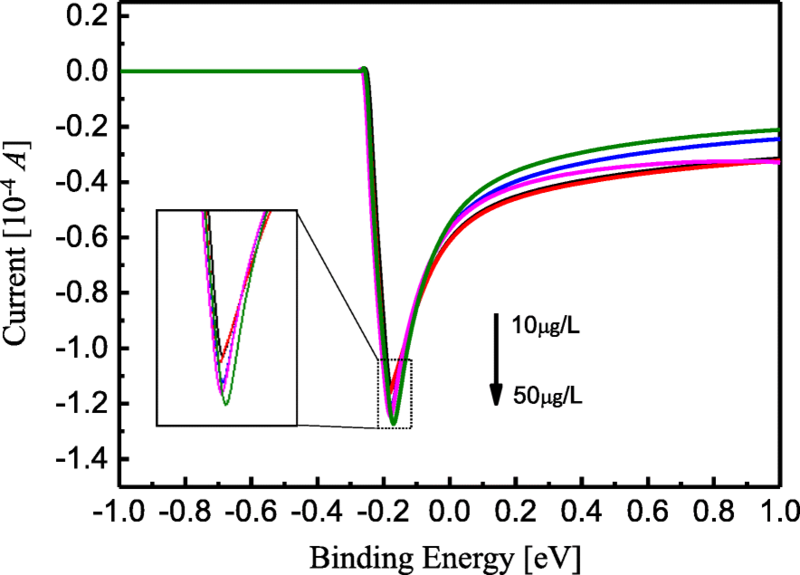 In order to obtain the experimental results, electrochemical stripping voltammetry was used to detect metallic Fe3+ ions with TiO2 nanotube arrays without Ag NPs deposition. The concentration of Fe3+ ions is set within a range from 10 μg/L to 50 μg/L. Dissolution current’s dependence on the voltage when Fe3+ ions were detected is shown in Fig. 5. During measurement, when the applied voltage was less than − 0.3 V, the dissolution current kept constant and remained approximately 0 A. When the applied voltage was within a range from − 0.3 V to − 0.16 V, the current dropped rapidly, and the peak reduced approximately from − 1.16 × 10−4 A to − 1.28 × 10−4 A with the Fe3+ ions concentration increment being within a range from 10 μg/L to 50 μg/L and with the voltage shifts being within a range from − 0.18 V to − 0.16 V, respectively. The inset shows current peak’s dependence on the applied voltage, as shown in Fig. 5. When the applied voltage V> − 0.16 V, the dissolution current increased exponentially and gradually, and stayed within a range from − 0.2 × 10−4 A to − 0.4 × 10−4 A. From this result, it can be seen that the peak of the current decreases with increase in Fe3+ ion concentration, and that the TiO2 nanotube array can be used as Fe3+ detection sensor. Dependence of the current peaks in Fig. 5 on Fe3+ ions concentration (from 10 μg/L to 50 μg/L) is also summarized in Fig. 6. The solid line is data fitting and is in alignment with linearity in a reasonable manner. Results of the fits can be calculated with y = 0.00373x + 1.1027, where y and x represent current and ion concentrations, respectively. 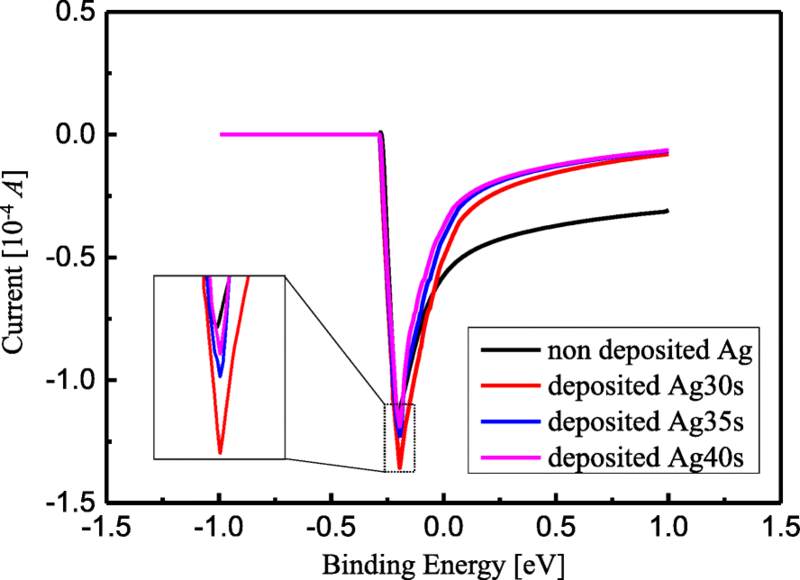 This fitting result is sufficient for showing that the minimum detectable Fe3+ ion concentration when TiO2 nanotube arrays without Ag NPs deposition are adopted is 37.3 μA/μg/L. The detection limit of Fe3+ (δx = (dy/dx)−1·(1/dy)) when the TiO2 arrays are used should be 15.01 nM with consideration of linear range. Here, dy/dx = 37.3 μA/μg/L, and δy = 0.01 μA, MFe = 56, respectively. This result is comparable to that in Ref . In this paper, the extinction ratio A700 nm/A520 nm is linear with the concentration of Fe3+ ranging from 40 mM to 80 mM, which can perform sensitive detection of Fe3+ ions with a detection limit of 14.82 nM when DTC-PASAu NP-based UV-visible method for on-site and real-time detection of Fe3+ in biological samples are adopted. Next, sensitivity enhancement of Fe3+ concentration detection for TiO2 nanotube arrays with Ag deposition was investigated, with deposition durations being 30s, 35 s, and 40s respectively. 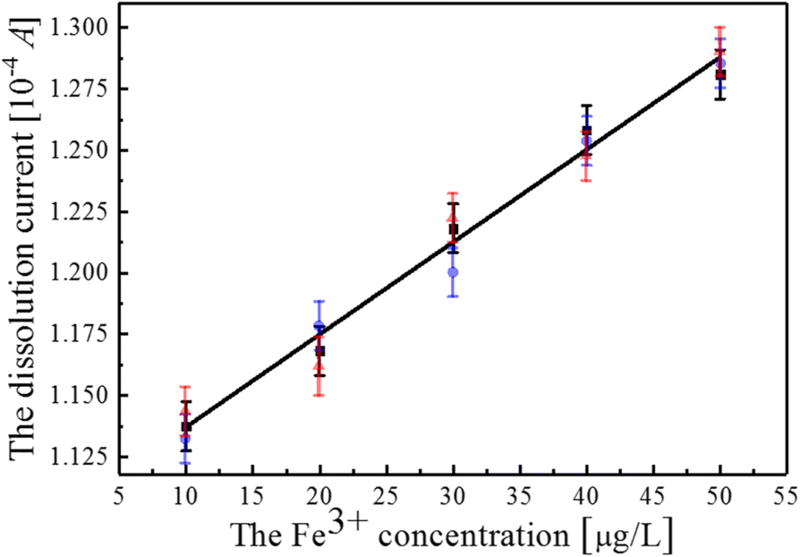 The Fe3+ concentration was set at 10 μg/L, and the result is shown in Fig. 7. When the applied voltage V was less than − 0.3 V, the dissolution current kept almost constant and was approximately 0 A. When the applied voltage was within a range from − 0.3 V to − 0.2 V, the current dropped rapidly to approximately − 1.35 × 10−4 A, and when the applied voltage was greater than − 0.2 V, the dissolution current increased exponentially and gradually, and stayed within a range from − 0.08 × 10−4A to − 0.4 × 10−4 A. The inset shows current peak’s dependence on the applied voltage, as shown in Fig. 7. Dependence of the peaks in Fig. 7 on the Ag NPs deposition with the duration being within a range from 0 s to 40 s is also summarized in Fig. 8, and the solid line presented data fitting. 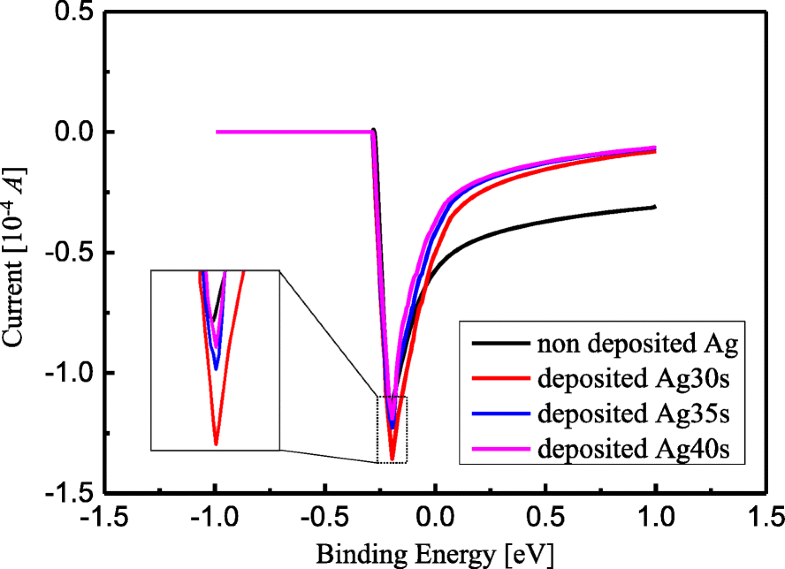 It can be seen that the current reached the maximum value (approximately − 1.38 × 10−4 A) when the deposition time of Ag NPs was 30 s. In particular, compared to the value of current before Ag deposition onto TiO2 nanotube arrays, the value of current increased to approximately − 1.15 × 10−4 A, which meant that sensitivity of the Fe3+ detection was enhanced by 20% when Ag NPs deposition occurred on TiO2 surface. Besides, the maximum value of current in the deposition duration of 30 s was considered to be directly related with diameters and uniform distribution of Ag NPs on TiO2 surface. Consequently, TiO2 nanotube arrays are characterized by relatively simple fabrication, high sensitivity, and reproducibility compared to other Fe3+ detection methods. Moreover, color change of the Ag colloidal solution can be distinguished with naked eyes, which can also be used to directly check whether Fe3+ exists in the solution and serves as a strong basis for this research. Therefore, functionalized Ag NPs on well-ordered TiO2 nanotube arrays provided low-cost, high-selectivity, and sensitivity sensing response for Fe3+ with a low limit of detection under ambient conditions. Notably, enhancement of sensitivity of Fe3+ detection can also be realized for other Fe3+ solutions with different concentrations. 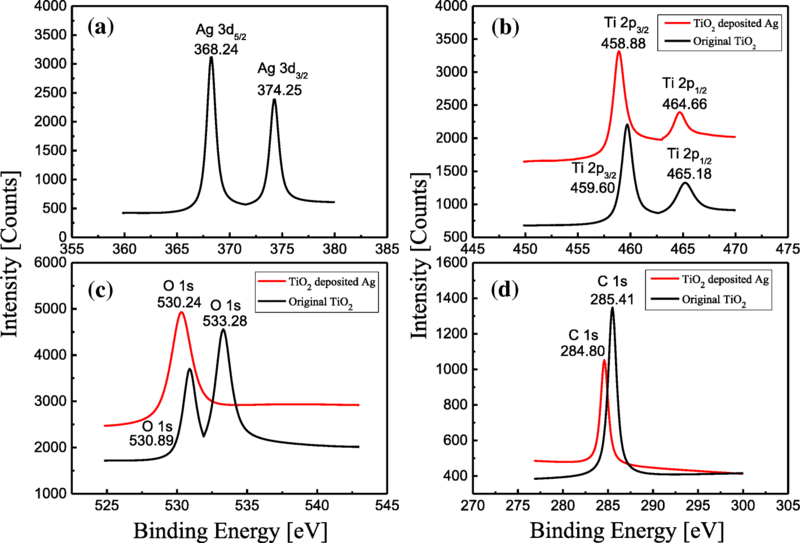 In order to demonstrate the selectivity of TiO2-Ag NPs for Fe3+ ions, competitive experiments were carried out in the presence of other metal ions when surface plasmon resonance (SPR), UV-visible spectrometry, etc. were used. Theoretically, the characteristic peak shift should occur only with the mixed solution of metal ions containing Fe3+ ions as indicated in Eqs. (1)–(4). We will focus on the competitive experiments next. TiO2 is an important functional material which is not only widely used in UV detectors, photocatalysts, and dye-sensitized solar cells, but also used in important potential applications in ultrasensitive sensors. In this paper, we present a method that utilizes well-aligned TiO2 nanotube arrays with Ag nanoparticles as voltammetry sensor for highly efficient detection of Fe3+ Ion. In the beginning, the anodic oxidation method was adopted to prepare ordered TiO2 nanotube arrays, followed by functionalized Ag NPs with the ability of iron ions sensing. Then, the spectrums of the TiO2 nanotube with/without the Ag NPs were compared by XPS, which proved that lattice oxygen in TiO2 nanotube arrays was released to adsorbed oxygen because of the interaction of Ag NPs. Therefore, when functionalized Ag NPs on nanotube arrays were used, iron ion sensing performed with the anodic stripping voltammetry method was investigated to validate their great potential in becoming heavy metal sensors, which proved that functionalized Ag NPs on well-ordered TiO2 nanotube arrays provided low-cost, high-selectivity, and sensitivity sensing response for Fe3+ with a low limit of detection under ambient conditions. This method creates new possibilities for developing sensors for monitoring of Fe3+ in biological samples without any sample pretreatment procedure. This work was partially supported by the Shanxi “1331 Project” Key subjects construction (1331KSC); National Key Research and Development Program of China (2018YFF01012502); National Science Foundation of China (NSFC) (61874100, 51727808); Natural Science Foundation of Shanxi (SXNSF) (201701D121080). ZM, XW, DZ, JW, and YX carried out the calculations, performed the experiments, drafted the manuscript with the help of YS, KH, XZ, and JL, participated in the design of the study, and helped to draft the manuscript. All authors read and approved the final manuscript.